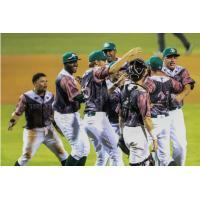 The Tortugas won an exciting Game 3 tonight at Jackie Robinson Ballpark in front of a LOUD home field advantage! What an amazing atmosphere and thanks to all the fans who attended. We will be back tomorrow night to Defend the Jack for Game 4 on Monday, September 10th in the Best of 5 Series. Get your tickets now! VIP, Reserved and General Admission tickets are available. Local star, Tortugas Ace and Florida State League All-Star Scott Moss will get the start for the Tortugas! Get your tickets online with the link above or call (386) 257-3172 for tickets. Box office will open at 8:30 am on Monday morning.